Muslims in Switzerland have found an interesting ally as Swiss voters weigh a ban on minarets, the towers of mosques from which the call to prayer is sounded. In many European countries, there has been a population explosion of Muslims, whose birth rate is far higher than Europeans. High crime in which Muslim immigrants figure prominently is another concern. There has been a movement to ban the construction of minarets, which some feel is an effort to mark the skyline with a towering Islamic presence. 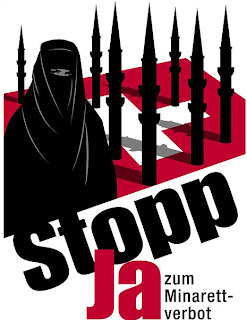 In Switzerland, it has been the Jewish community that has joined a campaign to oppose the ban. World News Australia reports as follows on the proposed ban. Switzerland's biggest Jewish groups have described a far-right push to ban the construction of minarets as a "threat" to religious harmony and the integration of Muslims. 49 of 50 States Lost Jobs Despite "Stimulus"
Airport Named After Jimmy Carter ! Vote For Thompson ! Dump Bloomberg !